Added new gear. It can be viewed in the shops. 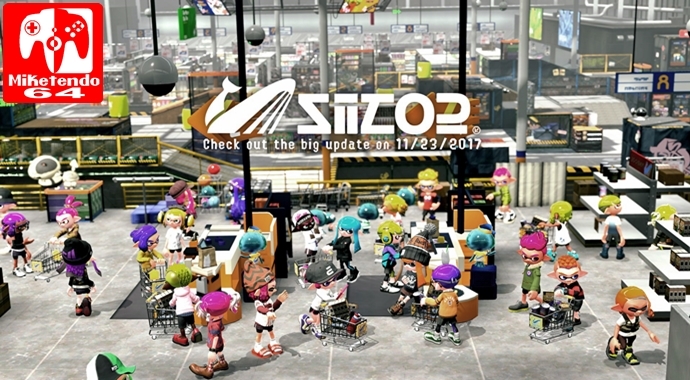 Added ability for players to buy and replace gear purchased on SplatNet with gear identical in appearance in the shops. Appearance Added two new hairstyles and two new legwear. On the Equip menu select Options and then Style, or choose Player settings on the Options menu on the main menu screen to change hairstyles, legwear, etc. Added 5 tracks to be played during battles. Added ability to take photos with Inkling Girl, Inkling Boy, and Inkling Squid amiibo on competitive stages while carrying weapons. Added ability to use filters when taking photos with amiibo. Increased player ranking maximum from 50 to 99. Added ability for players to speak to Judd after reaching level 99 to give them an option of returning to level 1 and start levelling up all over again. Players who choose to start from level 1 again will have a ★icon displayed next to their rank. Players who choose to start from ★1 again will continue to receive prizes from Judd for levelling up. Added ability for players who reach ★99 will have the option to start from ★1 again. The in-game ranking display of ★1 will not change, but players can see how many times they’ve returned to level 1 on SplatNet 2. When a communications error occurs because a player is idle, the match will be judged not from the time after the error, but from when the time the player became idle. You can now order a Fried Whip Cream Double Croissant, which increases battle cash you receive by 2.5 times, or a Galactic Seanwich, which increases battle experience you receive by 2.5 times. Added ability to get tickets for the menu items listed above in Salmon Run and The Shoal. Additionally, superior tickets are now easier to get. Added ability to change gear and continue after finishing Regular Battles, Ranked Battles, and solo Splatfest Battles. If you select this option after a Regular Battle, you’ll be able to continue with other players from the previous battle who’ve selected either “Continue” or “Change Gear and Continue”. Made ease-of-use changes to the stage selection screen for Private Battles. Added ability to select which stages will be available for random matches for Private Battles. Team selection will be maintained even if a member of a team drops out after a battle has finished, and the display order has changed for Private Battles. During Splatfests, a deployment diagram of Inkopolis Square during the Splatfest will be shown on the main menu map. Revised the software so unfinished posts are saved as saved data when you press the B Button to back out of the post screen. The unfinished post will be available to continue working on even after you restart the software. Reduced the amount of time between a player taking damage and beginning to recover from 1.5 seconds to 1 second. Slightly increased the height a player can jump when standing in opponents’ ink. Slightly delayed the timing with which a player’s movement speed and jumping power are reduced when momentarily stepping in opponents’ ink. This is also to make it easier for players who’ve unintentionally stepped in opponents’ ink to move over obstacles. Darkened the color of low areas on Turf Maps to make it easier to distinguish them from areas outside the maps. Specifications for some sound effects have been changed. The sound effect for Toxic Mist will now be played again when an opponent enters the affected area. Made it easier to hear the sound effects of the Point Sensor and the Toxic Mist when they detonate. Adjusted the sound of the Ink Jet making it easier to tell from which direction you hear it. Fixed a rare issue causing the sound effect of Chargers to not play. Slightly increased the volume of the pre-detonation effects for Splat Bombs and other explosives. Fixed an issue where a direct hit with a Sloshing Machine on an enemy just coming out of a state of invulnerability was being displayed but only causing damage of 38.0. Fixed a rare issue causing a player wielding Dualie-class weapons to drop through terrain when landing after having slid while falling. Fixed an issue causing launched umbrellas to appear in slightly different locations on the screen of the player who launched the umbrella, and the screens of other players even when the terrain itself had not moved. Fixed an issue causing both the player and the umbrella to take or not take damage from bombs, Splashdowns or other explosions depending on the connection state, or the timing of the opening and shutting of the umbrella. Fixed an issue causing players using Ink Armor, who cannot be splatted even with multiple direct hits from powerful weapons, to appear as if they had been splatted on the attacking player’s screen. Fixed an issue during Rainmaker causing sloped surfaces in the Splat Zone area on Starfish Mainstage to not display as having been inked on the Turf Map. Fixed an issue causing ink fired at the center mast on Manta Maria to drip in an unnatural manner. Fixed an issue causing players to get caught when walking over grates near spawn points on Manta Maria. Fixed an issue on Kelp Dome making it possible to ink the ground beneath the un-inkable structures on the stage, and include these areas in the final score. Fixed an issue on Kelp Dome causing Ink Storms to disappear rather than explode when hitting the underside of certain grates. Fixed an issue in Tower Control where the tower would hit a Bubble Blower bubble and then move at the same speed as the bubble, and maintain contact with it. Fixed an issue in Rain Maker where when a baller would explode at the same time the player using the baller gained possession of the Rain Maker, it would appear to other players that the player with the Rain Maker was carrying a regular weapon, and not the Rain Maker. Fixed an issue in Rain Maker where players in cover behind thin portions of the environment would take damage as if they had been hit with direct shots from the Rain Maker. Fixed a rare issue in Rain Maker where when the Rain Maker barrier and a bomb make contact near angled terrain, and the bomb explodes, no damage enters the Rain Maker barrier. Added the ability to choose the new stage Salmonid Smokeyard when playing at The Shoal. This stage will also be made available when playing online. Increased the number of weapons available at The Shoal by 10 types. Reduced the time between when a player takes damage and begins to heal from 1.5 seconds to 1 second. Slightly increased the height a player can jump when standing in Chums’ ink. Slightly delayed the timing with which a player’s movement speed and jumping power are reduced when momentarily stepping in Chums’ ink. This is also to make it easier for players who’ve unintentionally stepped in Chums’ ink to move over obstacles. Fixed an issue causing the sound effect for cannons firing to not play when an ally fires a cannon. Fixed an issue causing the sound effect of a launched umbrella striking a Scrapper to repeat again and again, or causing the sound effect to not play at all. Fixed an issue causing unnatural behavior when a Splashdown occurs at the same time a player enters a cannon. Fixed an issue causing a player with an opened umbrella who makes contact with a Scrapper to not be thrown backwards. Fixed an issue causing Golden Eggs to not appear when you defeat a Boss Salmonid because an ally had a connection error. Fixed an issue causing Golden Eggs to not appear when you defeat a Boss Salmonid after having repeatedly defeated Snatchers not carrying Golden Eggs. Fixed an issue causing bombs to disappear and cause no damage to a Flyfish’s missile launcher when thrown inside just as it closes. Fixed an issue causing players to fall from the tip of the ship into the interior. Fixed an issue causing unnatural behavior to occur when using Point Sensors on test cones. Fixed an issue in Spectator View causing the special gauge to appear differently on the player screen and the spectator screen. Updating to Ver.2.0.0 will disable the ability for players using Ver.1.4.2 or older to connect to The Shoal.